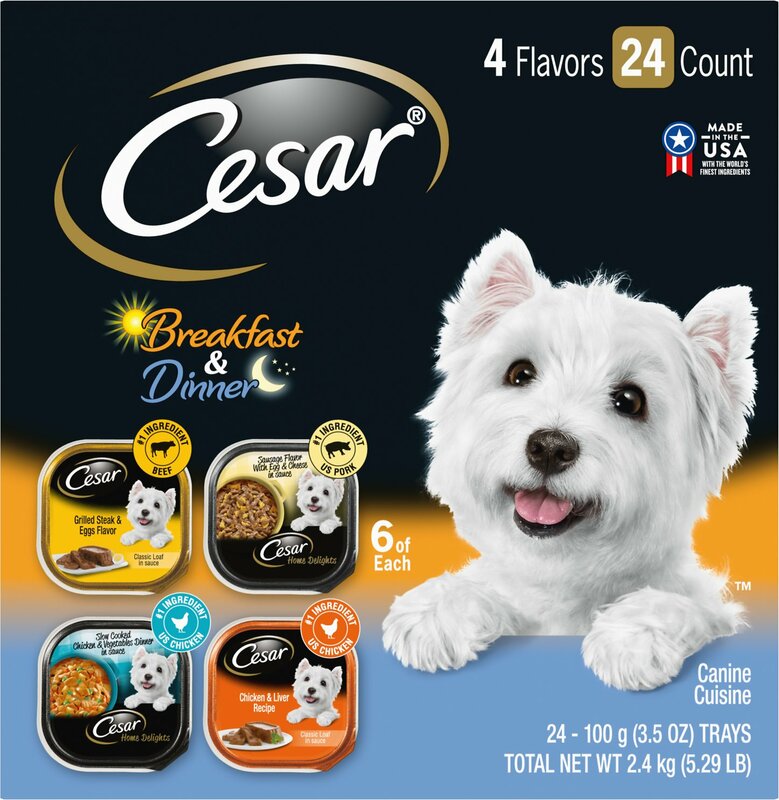 Serve up tail-wagging deliciousness in every bowl—day or night—with the Breakfast & Dinner Variety Pack from Cesar Home Delights. 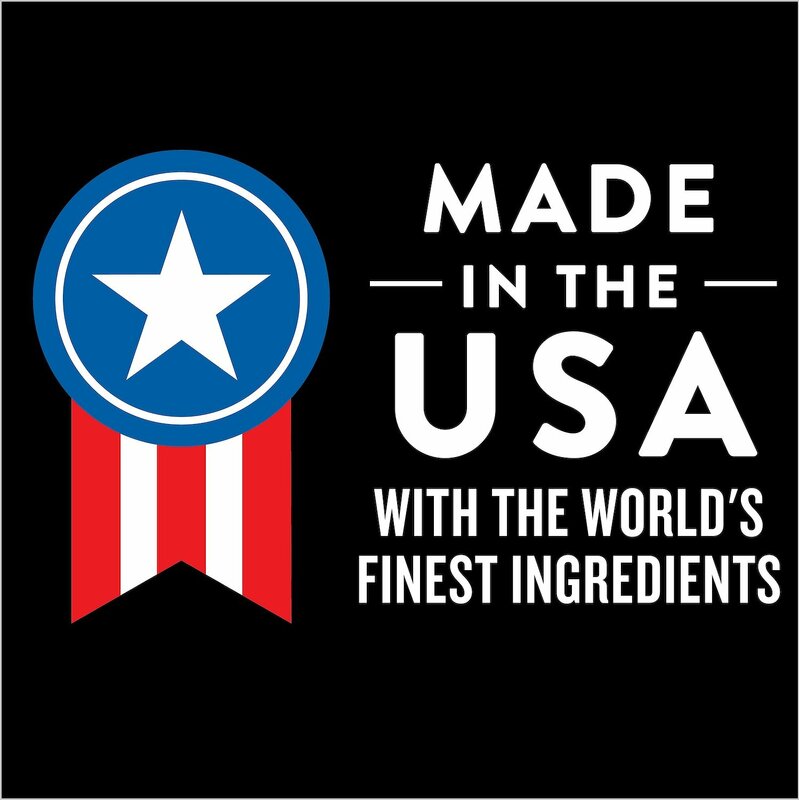 Made in the USA with real meat as the top ingredient, this variety pack includes some of your pup’s favorite flavors―including steak, sausage, eggs and liver―all packed into ready-to-serve trays that make mealtime a cinch. Best of all, each platter is packed with vitamins, minerals and essential amino acids to create a complete and balanced meal. 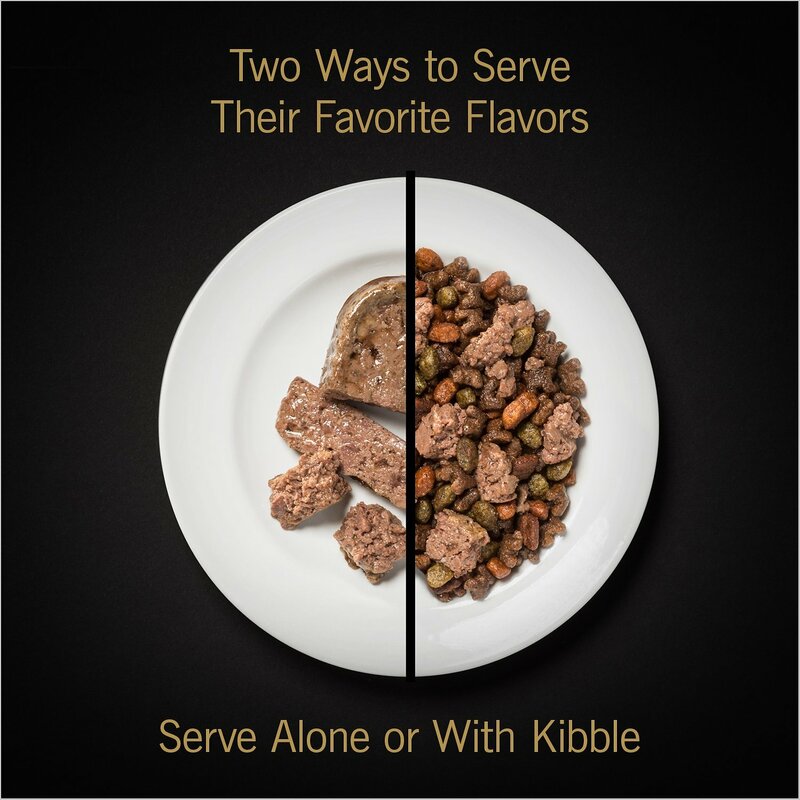 Serve alone or mix with kibble to delight picky eaters. Variety pack includes breakfast and dinner favorites, catered to your pup. Delectable meals put meat first for a smooth, protein-packed pate. Includes essential vitamins and minerals, making a complete and balanced diet for adult dogs. Comes in ready-to-serve trays that make portion control effortless and keep meals fresh. Cesar Classic Grilled Steak & Eggs Flavor: Beef, Chicken Liver, Beef Lung, Chicken Broth, Water, Pork By-Products, Chicken Heart, Calcium Carbonate, Sodium Tripolyphosphate, Added Color, Carrageenan, Potassium Chloride, Xanthan Gum, Magnesium Proteinate, Grilled Steak Flavor, Dried Yam, dl-Methionine, Salt, Erythorbic Acid (Preservative), Dried Egg Product, Guar Gum, Natural Flavor, Zinc Sulfate, Vitamin E Supplement, Monocalcium Phosphate, Sodium Nitrite (For Color Retention), Copper Sulfate, Thiamine Mononitrate (Vitamin B1), d-Calcium Pantothenate, Vitamin D3 Supplement, Potassium Iodide. Cesar Home Delights Sausage Flavor With Egg & Cheese: Pork, Chicken Broth, Water, Chicken, Chicken Liver, Wheat Flour, Dried Egg Product, Dried Cheese, Animal Plasma, Corn Starch, Wheat Gluten, Chicken Heart, Dried Plain Beet Pulp, Salt, Potassium Chloride, Calcium Carbonate, Choline Chloride, Sodium Tripolyphosphate, Added Color, Zinc Sulfate, Magnesium Proteinate, Xanthan Gum, Scrambled Egg and Sausage Flavor, dl-Methionine, Yellow #5, Yellow #6, Guar Gum, Manganese Sulfate, Vitamin E Supplement, Sodium Carbonate, d-Calcium Pantothenate, Biotin, Copper Sulfate, Thiamine Mononitrate (Vitamin B1), Riboflavin Supplement (Vitamin B2), Potassium Iodide, Vitamin A Supplement, Pyridoxine Hydrochloride (Vitamin B6), Vitamin B12 Supplement, Vitamin D3 Supplement. Cesar Classic Chicken & Liver Recipe: Chicken, Chicken Liver, Beef Lung, Chicken Broth, Water, Pork By-Products, Chicken Heart, Calcium Carbonate, Sodium Tripolyphosphate, Carrageenan, Potassium Chloride, Xanthan Gum, Magnesium Proteinate, Dried Yam, Added Color, dl-Methionine, Salt, Erythorbic Acid (Preservative), Natural Flavor, Guar Gum, Zinc Sulfate, Vitamin E Supplement, Monocalcium Phosphate, Copper Sulfate, Thiamine Mononitrate (Vitamin B1), Sodium Nitrite (For Color Retention), d-Calcium Pantothenate, Vitamin D3 Supplement, Potassium Iodide. Cesar Home Delights Slow Cooked Chicken & Vegetables Dinner: Chicken, Chicken Broth, Water, Chicken Liver, Potatoes, Carrots, Peas, Wheat Gluten, Animal Plasma, Corn Starch, Chicken Heart, Wheat Flour, Dried Plain Beet Pulp, Salt, Potassium Chloride, Dried Tomato, Calcium Carbonate, Sodium Tripolyphosphate, Choline Chloride, Added Color, Zinc Sulfate, Magnesium Proteinate, Xanthan Gum, dl-Methionine, Guar Gum, Manganese Sulfate, Vitamin E Supplement, Sodium Carbonate, d-Calcium Pantothenate, Biotin, Copper Sulfate, Thiamine Mononitrate (Vitamin B1), Riboflavin Supplement (Vitamin B2), Sodium Nitrite (for Color Retention), Potassium Iodide, Vitamin A Supplement, Pyridoxine Hydrochloride (Vitamin B6), Vitamin B12 Supplement, Vitamin D3 Supplement. Cesar Classic Grilled Steak & Eggs Flavor: Feed adult dogs approximately 3 � trays daily per 10 lbs. body weight. Cesar Home Delights Slow Cooked Chicken & Vegetables Dinner: Feed adult dogs approximately 3 1/2 trays daily per 10 lbs. body weight. I for the most part enjoy Cesar dog food, however I didn't like these. Too much gravy and not enough food. I hope my mommy won't buy this again. My lol wicked get bored with the same flavor food, but the variety pack makes his feeding much easier.